JV García Santamaría, J Martín Matallana (2017): “Municipal transparency in Spain: Analysis of the most influential factors”. Revista Latina de Comunicación Social, 72, pp. 1.148 to 1.164. Introduction. This article aims to determine the most influential factors in the degree of transparency of Spanish municipalities, according to the Municipal Transparency Index (ITA). In particular, the study focuses on the detailed analysis of four possible factors of influence: political party, number of inhabitants, geographical location, and level of per capita income of the municipality. The conclusion is that, at the moment, and given the evolution of this Index, none of the previous factors constitutes a determinant in the degree of transparency. In order to carry out a more extensive and precise analysis it would be necessary to expand the methodological procedures followed by the Municipal Transparency Index (ITA) and include new factors of study. Methods. The study is based on literature review, in-depth interviews with a panel of experts and the study of the factors that influence the most the degree of municipal transparency. Results and conclusions. The progress experienced in municipal transparency is significant but it would be advisable to also evaluate and improve the procedures used to calculate the Municipal Transparency Index (ITA). Transparency, municipal transparency, transparency portals, good corporate governance, accountability. 1. Introduction and state of the art review. 2. Objectives. 3. Methods. 4. Tools in the service of transparency. 5. ITA 2017 results. 5.1. Political party. 5.2. Number of inhabitants. 5.3. Level of income per capita. 5.4. Geographical location. 6. Conclusions. 7. Notes. 8. References. Transparency is an effective tool that can transform public management and enables citizens to check the performance benchmarks and interests of public authorities, particularly the local administrations, which in turn strengths the political debate and democracy (Conejero Paz, 2014). Understood as the unifying principle of any state, public transparency brings institutions closer to citizens and allows the latter to trust the political decision-making centres. In addition, it can be an essential tool to combat corruption and improve the quality of our democracies, which are marked by a culture of public secrecy (Álvarez, 2007:6). Transparency can be defined, therefore, as the duty of all public authorities to account for their actions and reasonably explain their performance (Arenillas and Redondo, 2011:360). However, it is also clear that transparency cannot be understood solely as a particular goal, but as a means to ensure that decisions are reasonable and motivated and that the information used for decision-making is accessible to the public (Jiménez et al. 2012). Moreu Carbonell (2005:65) has gone so far as to say that the evaluation of institutions involves interpreting the information obtained from them based on credible, reliable and useful evidence. Transparency and information go hand in hand (Cotino, Sahuquillo and Corredoira, 2015, Guichot Reina, 2011a, Hollrah, 2005). In fact, De Ferranti et al. (2009) define it as the availability and growing flow of timely, comprehensive, relevant and high-quality information related to governmental actions. Thus, transparency becomes the active disclosure of public information and involves the compulsory publication of all public decisions taken by governments and public administrations. Transparency is, thus, very closely tied to accountability (Ackerman, 2008). However, without a doubt, the most important benefit of transparency is that allows citizens to assess the performance of institutions and maintain their trust in them (Labeaga and Muñoz, 2013). And this assessment of institutions involves the interpretation of the information of institutions, based on credible, reliable and useful evidence (Garde Roca, 2006). The concept of transparency began to appear in the Spanish political debate with the emergence of the economic crisis, when the government and institutions perceived the delegitimisation of their performance and the need to overcome it (Morales García et al., 2016). In few years, this concept emerged in the ideology of all political parties and administrations as a whole. In many cases it is even linked to related concepts such as “democratic regeneration”, the fight against administrative corruption, good governance and access to public information. Transparency is also the active involvement of citizens in the public management as a civic audit; is the legitimacy and accountability of public servants by virtue of accountability; is a discursive tool to legitimise actions and political decisions and, of course, is the most effective barrier against administrative corruption. As Madrid’s former Mayor, Enrique Tierno Galván, has claimed, “public servants’ pockets must be transparent”. Municipal government transparency, thus, acquires a double dimension. An active dimension, in virtue of which municipal administrations are legally obliged to make public information available to citizens, from administrative procedures and acts to resolutions and budget distributions. And a passive dimension, in which citizens themselves, by their own initiative, request administrations the information they deem appropriate to exercise the role of counter-power (O´Leary, 2011). Regardless of the inherent cultural and educational element implicit in municipal transparency -insofar as it requires the participation of the citizenry to be exercised in all its fullness–, the legal regulation of the phenomenon is always the first step to make mandatory what has traditionally been a simple alternative adopted by a minority of our governments (Cendejas Jáuregui, 2007). In this sense, it should be noted that in the case of Spain, the regulation of transparency has been especially delayed the country did not enact a law specialised on transparency until 2013. The regulation was limited to article 105.b of the Spanish Constitution as a frame of reference for citizens and administrations to know what to expect in terms of transparency and access to public information. We must not lose sight that the aforementioned precept was limited to laying the groundwork for a right of access to information that required, necessarily, relevant legal development through an ordinary law (Guichot Reina, 2011b). On 9 December 2013, Spain promulgated the Law 19/2013 on Transparency, access to public information and good corporate governance, 30 years after the Constitution laid down the bases for the right of access to information in article 105.b (Mendel, 2006). Despite the fact that the regulatory delay constituted a huge opportunity for our country to develop an advanced and exemplary transparency law -in view of the numerous reference models provided by the laws enacted by neighbouring countries-, the reality was quite different: the Law 19/2013 arrived late and was mostly considered as a “law of minimums”, that was limited to consolidate a number of basic standards of political discourse. As a consequence of its many shortcomings the Law became the target of numerous criticisms: its no-classification of the right of access to information as a fundamental right; the excessive amount of absolute exceptions; the negative administrative silence; the absence of autonomous mechanisms of control, inspection and sanction, and guarantees; its unacceptable subjective exclusions, and the existence of a single law to regulate two different and independent spheres such as transparency and good corporate governance. In any case, and regardless of the criticisms that put the Law at the bottom of the regulation on transparency in the framework of the European Union, there is no doubt that the enactment of Law 19/2013 has resulted in a development that will hardly be able to take steps backs, insofar as it has made “mandatory” what was once optional and minority. In short, a government is transparent when it offers information about its operation, is held accountable, explains its actions and is responsible for its acts (Morales et al., 2016). And this action is essential to encourage a culture of transparency and accountability (FEMP, 2010). The main objective of this article is to determine the factors that influence the most the degree of transparency in Spanish municipalities. In particular, the article aims to offer a detailed analysis of four possible factors of influence: political party, number of inhabitants, geographical location and level of per capita income. These are factors that, in principle and according to the consensus of the consulted experts, may be decisive in determining the degree of transparency. The secondary objectives of this article are to compare the results of the Municipal Transparency Index (ITA) of 2017 and previous years; as well as the analysis of some possible factors of secondary influence, such as the gender of the mayor or the political strength of the city council. On the other hand, the ultimate goal of the research is to determine whether the prevailing method in Spain, conditioned by ITA, is good enough or could be substantially improved with the inclusion of other indicators or new study factors. The research method combines three tools: a) a review of the academic literature on transparency, good governance and accountability; b) the study of the factors that influence municipal transparency the most, based on the detailed analysis of the results provided by the ITA2014 and 2017 reports, as well as previous indicators. The sample is composed of 110 city councils belonging to the largest Spanish municipalities, whose transparency scores are calculated based on a total of 80 indicators, divided into six areas of transparency. In accordance with the previous, and in relation to the factors affecting to a greater or lesser extent the transparency degree of Spanish municipalities, we have formulated the hypothesis that the degree of municipal transparency depends on four factors of the municipality in question: the political party; population; level of wealth, understood as the GDP per capita; and finally, the geographical location of the municipality. It is important to highlight that some entities have designed different measurement and evaluation systems to assess municipal transparency, but these systems have not been standardised and this disparity in measurement criteria and methods yields substantial variability in results (Delgado, 2015). Therefore, and although the acceptance of ITA is wide, we have resorted to a panel of six experts to determine the limitations of the ITA and determine whether the levels of transparency in the Spanish municipalities are reasonable. These experts belong to the areas of municipal administration, economics, sociology and law. A focus group and in-depth interviews, with a semi-structured 10-item questionnaire, were used to collect data that have led us to interesting conclusions on the techniques currently used. The panel of experts was used also because a handful of scholars have considered it is suitable to address transparency through an integrated approach; an approach that would make it possible to identify the political and administrative variables influencing the institutionalisation of transparency (Ackerman, 2008, Albassam, 2016, Ferejohn, 1999, Gaventa and McGee, 2013). Complementarily, we must not forget that access to public information, ultimately, resides in the digital world and the new media. Thus, websites emerge as the decisive element to connect citizens with public administrations to reach a truly effective level of government transparency. This requires an intuitive, interactive, easy-to-navigate, unrestricted website that is, of course, accessible to all citizens. Therefore, the randomised study of the websites of the Spanish municipalities of varying size, geographical location and political party, although is not an exhaustive sample, will allow us to appreciate the usefulness of the information they offer and to determine whether the principle of transparency is reflected in the detailed and accessible treatment of the most relevant information offered by our municipalities to ordinary citizens. It is necessary for the data to be accessible, relevant, and high-quality (Ferejohn and Kuklinski, 1990). Also relevant, as an object of study, are other factors, which, at times, lack the necessary relevance, as it is the case of the visibility of the institutional agendas (Méndez Juez, 2017). In conclusion, it is not enough to set up electronic management systems that bring institutions closer to citizens, but also to generate valid procedures that enable the public to interact with public managers (Beltrán and Martínez, 2016). In Spain, the national Portal of Transparency is the platform that gives access to the public information generated by the General Administration of the State, which is categorised into three levels: a) institutional: organisation, structure and functions of the Ministries; b) economic: administrative and budgetary management; and c) normative: legal information and regulatory texts applied by the respective ministries. As it occurred with the Law 19/2013, the Transparency Portal became a target of criticisms, as a result of the deficiencies it presented in its search options -it did not classify data in accordance with basic computer conventions-, so it only allows users to filter documents by Ministry and date, making this task enormously difficult; the impossibility to retrieve data in editable formats, which forces users to manually search and transcribe the information; and the requirement of the electronic National Identity Document (DNI) for access, which obviously has a deterrent intention, since less than half of the Spanish population has this document. Similar criticisms have been directed, in general terms, to their counterparts at the regional and local levels. In parallel to the above-mentioned governmental public transparency portals, Spain also has private platforms that provide access to public information, such as those promoted by the Civio Foundation, including Tu derecho a saber (“Your right to know”), a website that serves as an intermediate between citizens and administrations, and unifies repeated requests; El BOE nuestro de cada día (“Our daily Official State Bulletin”), a platform that analyses, relates and simplifies the content of the Official State Bulletin (BOE), in order to make it understandable for citizens; and Dónde van mis impuestos (“Where are my taxes going?”), a tool that allows users to see how public money is used. When we talk about transparency at the municipal level it is essential to refer to ITA (International Transparency Spain), a study that, since 2008, measures the degree of transparency of the 110 largest Spanish municipalities, which are categorised in a ranking. In order to perform this classification, ITA analyses a total of 80 different indicators, grouped into six broad categories: information about the municipal corporation; relations with citizens and society; economic and financial transparency; transparency in staff recruitment and costs of services; transparency in urban planning, public works and environment; and Indicators of the Law on Transparency. Based on those indicators, each city council obtains a final score. Each edition of this study encourages councils to improve their level of transparency by promoting greater interaction between local governments and their citizens (Piñar Mañas, 2010). However, the study also has certain weaknesses as it does not take into account the use of open formats nor individualised access for the dissemination of public information as well as other aspects that may seem tangential, such as the recording of the municipal meetings, which in many cases is not allowed. The vast majority of councils included in the sample have created within their respective website a special page dedicated to transparency, with a specific section for the ITA indicators. All this confirms that the commitment to transparency of the municipalities is already widespread, and responds to the civil society’s demand for access to greater volumes of information. However, there are limitations that should not be overlooked and that will be addressed here. A significant number (25) of the 110 councils evaluated has published all of the 80 indicators considered in the ITA 2017 report, which demonstrates the importance that local corporations -due to the social demand and the legislation- grant to municipal transparency, which is already a widespread fact in our councils. However, it is worrying that around 44% of the municipalities do not reach the minimum score of 90 out of 100 points. The average scores achieved by the sample of councils have been higher than those of the previous edition (2014), which in turn had been higher than those of the previous years. Thus, the overall average score of the 110 councils in 2017 was 89.7 points out of 100; of 85.2 in 2014; 70.9 in 2012; 70.2 in 2010; 64.0 in 2009; and 52.1 in 2008. In addition, in each of the six analysed areas of transparency, the mean scores of the sample of councils have also been higher than those of the last edition. All these figures indicate, according to the data of ITA, that municipal transparency improves year after year in Spain. With regards to the historical evolution of ITA, it is important to mention that in the first edition of 2008 only one council reached the highest possible rating: Bilbao, a pioneer in transparency, with 100 points out of 100. In comparison, the number of councils with perfect scores was 19 in 2014, and 25 in 2017:Alcobendas, Alicante, Barakaldo, Barcelona, Bilbao, Getxo, Gijón, Girona, Huelva, Jerez de la Frontera, Las Palmas de Gran Canaria, Las Rozas, León, Lérida, Logroño, Madrid, Manresa, Oviedo, Pozuelo de Alarcón, San Cristóbal de La Laguna, Soria, Terrassa, Torrejón de Ardoz, Torrent and Vitoria. Regarding the six areas of transparency under evaluation, it should be noted that they can still be considered pending issues: Transparency in recruitment (with a rating of 85.8 points) and transparency in urban planning and public works (with 86.0 points). The higher scores were obtained in the area of financial transparency (93.1) and active transparency (92.7). From a strictly theoretical perspective (Guillamón et al. 2011), municipalities governed by progressive parties are more transparent than those governed by conservative parties. In the same vein, Ferejohn (1999) argues that politicians who wish to increase the size of the public sector should increase transparency so that voters can trust them with more resources. Therefore, since progressive governments are advocating for a greater public sector, they will be willing to implement higher levels of transparency than conservative governments. Although from a strictly theoretical logic we might think that the political party of the local government is a determining variable in terms of municipal transparency, in the light of the data provided by the ITA 2017, we cannot affirm categorically that this is a decisive factor. There is a fair distribution of political parties at different levels of transparency, which means that councils led by the different political ideologies prevailing in our country get similar scores. In this sense, Jesús Lizcano Álvarez (2012) affirms, in relation to the results of the ITA 2009, that “transparency is not a question of political party, it is a question of attitude, of someone wanting to be transparent” (1). As we can see in Table 1, no political party is by itself more transparent or opaque than others. The proportions are similar in all categories, especially in the high transparency category; the most representative and reliable as it contains a much larger sample than the other two. For example, the Popular Party governs municipalities with outstanding scores (Las Rozas, León and Santander), as well as municipalities with low levels of transparency, as it is the case of Badajoz, with a score of 75.6 points out of 100. Put in another way, the group of 25 councils that obtained the highest score possible in 2017 includes very different political parties, although there is a slight inclination towards the options other than the Popular Party. According to the fifth edition of the report, Transparency, the best slogan (2017), carried out by Commitment and Transparency Foundation, none of the national political parties reached the category of “transparent”, while the number of transparent foundations increases in each new report. Despite the fact that these results contrast with the pro-transparency discourses of the different political leaders, the reality is that, after a light and positive evolution, traditional parties have become stagnated in the improvement of their accountability actions. Meanwhile, the new parties that have been added to the sample have also brought positive data for the fulfilment of the transparency indicators. However, in general terms, political parties do not come off well from their assessments . Other variables are the mayor’s gender and the degree of political strength of the council. Although for some experts it is not a determining factor, in the 110 municipalities evaluated in the ITA 2017 report, there is a majority of male mayors in comparison to female mayors: 81 against 29, respectively. While the transparency levels of the councils governed by women obtained higher average scores than those governed by men (90.3 against 89.4), the difference is so low that we cannot consider the genre of the mayor to be a determining factor in terms of transparency. With regards to the political strength of the council, Guillamón et al. (2011) point out that “the further fragmentation of the local government entails a higher level of transparency (...), which shows that the political parties that constitute the majority of the local government make use of their majority power to obstruct the informative opening of the councils they govern (...)”. According to various authors, political competition between the members of the coalition parties encourages the publication of public information, due to the desire of politicians to limit the ability of members of the government who do not belong to their party (Kaumann and Kraay, 2002, Pierre, 2010 and Rodríguez Pallarés and Pérez Serrano, 2017). Another factor frequently used to assess differences in transparency across municipalities is the size of the population of the municipality in question. Normally, it can be assumed that municipalities with the largest number of inhabitants will have a much more standardised and controlled public management and greater transparency. In the same way, from the opposite angle, it can be argued that a larger municipality is more complex and thus will end up leading, inevitably, to greater opacity. However, the size of the municipality, especially in big cities, adds new and enormous complexities in terms of management. While it is true that in the light of the data provided by the ITA 2017 study larger councils obtained higher mean scores in terms of transparency, this study is based on an inherent bias since the selected sample is composed precisely of the 110 largest Spanish municipalities. Therefore, we can conclude that the degree of municipal transparency does not present a direct causal relationship with the number of inhabitants of the municipality. Thus, there are high transparency scores in locations of great dimension –with Madrid, Barcelona and Bilbao at the top- as well as in municipalities with significantly smaller numbers of inhabitants, like Sant Cugat del Vallés, with just 88,000 inhabitants, and Pozuelo de Alarcón and Las Rozas, with even smaller numbers of inhabitants. In this sense, a revealing finding is that of the 25 municipalities with the highest scores in the ITA 2017, nearly half are even provincial capitals: Alcobendas, Barakaldo, Getxo, Jerez de la Frontera, Las Rozas, Manresa, Pozuelo de Alarcón, San Cristóbal de La Laguna, Terrassa, Torrejón de Ardoz and Torrent. We might also consider that the level of wealth of the municipality could determine, or at least influence, the transparency level of a city council. Guillamón et al. (2011) point out that different authors (such as Piotrowski and Van Ryzin, 2007) have shown that the economic level is positively correlated to fiscal transparency. In other words, the economic situation of the municipality has a significant influence on the level of financial transparency. For these authors, it seems clear that municipalities with lower rates of unemployment, and, therefore, a solid economic situation, will be more transparent. 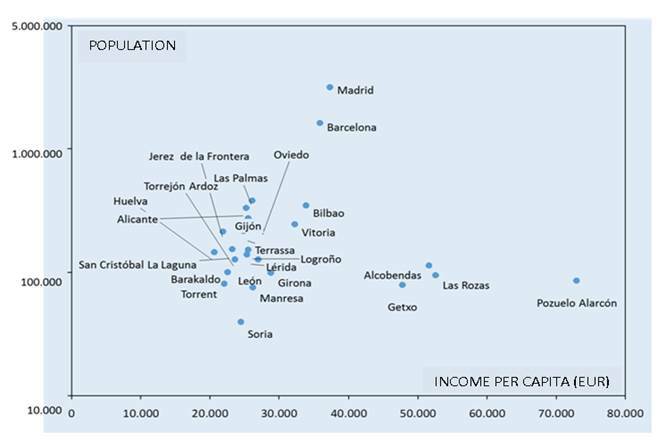 And according to ITA, this is the case of many places that are not even provincial capitals, like Getxo, Sant Cugat del Vallés, Pozuelo de Alarcón or Las Rozas. On the other hand, the total per capita expenditure is higher in more transparent municipalities. Thus, the well-known principle that level of income and education are intimately linked is confirmed: one is a consequence of the other and vice versa. Finally, it is time to consider whether there are territories that are, a priori, more transparent than others in Spain. However, although in our country the largest cases of corruption occur in the local governments of coastal municipalities, close to large urban municipalities, transparency levels do not appear to be governed by territorial criteria. Data of the ITA 2017 study point out, for example, that within a same autonomous community, as for example Andalusia, there are municipalities with a high transparency (Huelva), medium transparency (Jaén) and low transparency (Almería). Likewise, municipal transparency and regional transparency neither seem to have an absolute correspondence: according to the ITA 2014 study, Madrid’s City Council obtained an outstanding score of 92.5 points out of 100, while the Community of Madrid, according to the Transparency Index of the Autonomous Communities, obtained mediocre results in relation to the other autonomous communities: a score of 65 points out of 100. However, this gap has been reduced today: according to the ITA 2017 study, Madrid’s City Council obtained a score of 100 points out of 100 in terms of municipal transparency, whereas, according to INCAU, the Community of Madrid obtained a score of 98.1 points out of 100. On the other hand, the analysis of the distribution of the 25 municipalities with a Transparency Index of 100 (ITA 2017) by population and per capita income, indicates that those municipalities with the highest index of transparency have between 100,000 and 1 million or more inhabitants, and that most of them have an income per capita of between 20,000 and 35,000 euros. In such a way that, for example, a municipality like Soria, with just 40,000 inhabitants and an income per capita of almost 25,000 euros (occupies the 425th position by income) is located at the same level as Pozuelo de Alarcón, the municipality with the highest income in Spain, with more than 70,000 euros and a population close to 85,000 people. In other words, and according to data from the INE 2016 report, ITA’s list of the 25 most transparent municipalities does not take into account some of the councils included in Spain’s top ten municipalities (Majadahonda, Sant Cugat, San Sebastián and San Sebastián de los Reyes) nor others that would be among the top 20 according to income, like Casteldefells, Cerdanyola del Vallés, Ceuta and Pamplona. Thus, the hypothesis that higher income produces a higher level of transparency ceases to be valid, or perhaps this variable has not been verified accurately. It seems as if complying with the precise requirements set by ITA was the fundamental part of the development of the ranking. We believe that the factors that we have analysed here have a decisive incidence in the degree of transparency of the municipalities. But according to ITA, none of them is as important as to be decisive in the sample of the 110 selected councils. In this way, we can deduce that, in most cases, affiliation to a particular political party does not constitute a determining factor, just like the income per capita, the territorial distribution and much less the population size of the municipality. There is, therefore, a human factor to be considered: the free will of the Mayor and the Councillors who compose the Corporation. Thus, future research should determine the influence of the identities and education of the council members. - Although ITA is a significant development, it would be convenient to also perform deeper analyses, considering other important aspects such as the institutionalisation of transparency; the degree of validity of accountability; the greater dissemination of institutional agendas and greater expository clarity –subject to prior treatment- of major accounts and large numbers. In short, having files with high quality information that is also comprehensible for citizen .There are also other questions that remain unanswered: how does ITA deal with organised corruption and cases such as Cartagena? How do these cases affect the involved municipalities? Is there a loss of reputation? And if so, how should it be reflected in the index. - Despite the good evolution of ITA, a large number of municipalities (44%) do not meet the quality standards yet. In the same way, in addition to the 110 selected municipalities, it would be convenient to select a representative sample of the scope of the implementation of transparency and accountability in municipalities with less than 50,000 inhabitants in order to measure the gap that separates them from the elite. Moreover, one of the experts considers that it is precisely in small municipalities where the need for greater transparency is most appreciated. - ITA does not allow us to verify that the information provided by councils is accurate. In other words, data on staff recruitment and compensation for mayors and councillors are not necessarily verified by an external audit team. For many of these experts, it is necessary to audit websites, which are, in some cases, clear instruments of propaganda. Of the sample of websites of municipalities with less than 30,000 inhabitants we can highlight, firstly, that almost none of the cities with 5,000-10,000 inhabitants want to miss the train of transparency. They all have some sort of portal of transparency, but in many cases -in councils governed by all political parties– do not disclose essential information on staff recruitment, the curriculum vitae of councillors and municipal budgets, among others. - Transparency desperately needs citizen participation for its consolidation. How can this participation be promoted? What steps are taken and which methods are adopted, at least in councils of a certain size, to put at the disposal of citizens understandable summaries of the provisions and account statements that concern them? Put differently, it is not enough to just publish that information in the portals of transparency; the challenge is also to make it understandable to the citizenry. - According to the panel of experts, the point is not to just to make public servants comply strictly with their obligations and duties. They have to go beyond that by promoting the participation of citizens, extending the ethical references in all areas of the municipal government and implementing better controls for public servants. In short, it is necessary to promote the acquisition of a culture of transparency and do not forget what the process of accountability actually means. - For some experts, who acknowledge the progress achieved with the introduction of ITA, most of the Spanish municipalities are not yet transparent and have work to do in order to become so. Experts recognise, however, that municipalities that have a competent civil service and mayors and council members motivated to reach a good ranking in the ITA reports do get better results. - Finally, the experts highlight that complying with the indicators of the system does not guarantee that corporations are objectively transparent, unless there is a professional and independent audit that backs up the data reflected in these indicators. The Ranking 2017 of the quality of democracy in the Spanish political parties is a research work directed by José Antonio Gómez Yáñez, Professor of the Carlos III University of Madrid. It involves a questionnaire of 41 indicators, grouped and weighted in five chapters: internal democracy, candidate selection system, rights and protection of affiliated members, public information about the party and advertising of ethical codes. The Ranking concludes, for the third time, that none of the Spanish political parties would comply with the performance standards established by the German Political Parties Act or with the standards of Great Britain in terms of: annual or biennial conferences, celebration of fixed-date conferences, election of candidates to public office by vote of party members residing in the district, periodic meetings of internal parliaments (councils, committees, boards), etc. A. Morales García et al. (2016): “La Transparencia en la política española: análisis de sus influencia y presencia en medios sociales”. Ibersid. 10(2), pp. 91-96. B. A. Albassam (2016): “The influence of Budget Transparency on quality of Governance”. Mediterranean Journal of Social Sciences, Vol. 7, Nº1. D. De Ferranti et al. (2009): How to improve Governance. Washington, D.C.: The Brooking Institution Press. D. Kaumann & A. Kraay (2002): “Growth without Governance”. The World Bank: World Bank Development Research Group. Policy Research Working Paper. E. Guichot Reina (2011b): “Transparencia y acceso a la informaciónpública en España: análisis y propuestaslegislativas”. Madrid: FundaciónAlternativas. E. Guichot Reina (Coord.) (2014): Transparencia, acceso a la informaciónpública y buengobierno. Estudio de la Ley 19/2013, de 9 de diciembre. Madrid: Tecnos. E. MoreuCarbonell (2005): La Administraciónanunciante. Madrid: Editorial Aranzadi. I. Álvarez (2007): Relatoría especial para la libertad de expresión. ComisiónInteramericana de los DerechosHumanos, Washington D.C.: oea. J. Ackerman (eds.) (2008): Másallá del acceso a la información. Transparencia, rendición de cuentas y estado de derecho.México: Siglo XXI Editores. J.A. Ferejohn & J.H. Kuklinski (1990). Information and democratic processes. Urbana: University of Illinois Press. J.A. Ferejohn (1999): “Accountability and authority: towards a model of political accountability”. In Przeworski, A., Stokes, S. C. & Manin, B. (Eds. ): Democracy, Accountability and Representation. New York: Cambridge University Press, pp. 131-153. J.A. Garde Roca (2006): “La institucionalización de la evaluación de las políticas públicas en España”. Auditoría Pública, nº 39, pp. 17-26. J. Gaventa & R. McGee (2013): “The Impact of Transparency and Accountability Initiatives”. Development Policy Review, 31 (s1), pp. 3-28. A. L., (coord. ): El gobierno local. Estudios en homenaje al profesor Luis Morell Ocaña, Iustel, Madrid, pp. 1023-1044. J.M. Labeaga Azcona & C. Muñoz Martínez (2013): “La evaluación de políticas públicas en España: aprendizaje y prácticas institucionales”. Revista de Evaluación de Programas y Políticas Públicas, nº 1, pp. 31-53. J. Pierre (Ed.) (2010). Debating Governance. Oxford: Oxford University Press. J. Vila i Vila (2013): “Determinantes de la transparencia contable en los municipios”. Auditoría Pública, nº 60, pp. 57-64. L. CotinoHueso, J.L. Sahuquillo Orozco, L. Corredoira Alfonso (eds.) (2015): El paradigma del gobierno abierto. Retos y oportunidades de la participación, transparencia y colaboración. Madrid: Universidad Complutense. M. ArenillaSáez& J. C. Redondo Lebrero (2011): “Ética, transparencia y participación”. En Arenilla Sáez, M.: Crisis y reforma de la Administración Pública. A Coruña: Netbiblo. M. Cendejas Jáuregui (2007): “Evoluciónhistórica del derecho a la información”. Derecho Comparado de la Información, nº. 10, pp. 57-84. M. Méndez Juez (2017): “Transparencia pública en la regeneración democrática”. Cuadernos de Gobierno y Administración Pública, 4-1, pp. 89-105. M. Rodríguez Pallares & M.J. Pérez Serrano (2017): “Decisión y transparencia en información y conocimiento. Estudio de caso de las empresas de comunicación cotizadas españolas”. Revista Latina de Comunicación Social, 72, pp. 719 a 736. R. O´Leary et al. (eds.). The Future of Public Administration Around the World. Washington, D.C., Georgetown University Press. T. Mendel (2006): “Consideraciones sobre el estado de las cosas a nivel mundial en materia de acceso a la información”, Derecho Comparado de la Información, Nº 8, pp. 3-15. P. Beltrán Orene & E. Martínez Pastor (2016): “Grado de cumplimiento de las leyes de Transparencia, Acceso y Buen Gobierno y de reutilización de los datos de contratación de la Administración central española”. El Profesional de la Información, vol. 25, nº 4, pp. 557-567. Article received on 30 July 2017. Accepted on 2 October. Published on 9 October 2017.